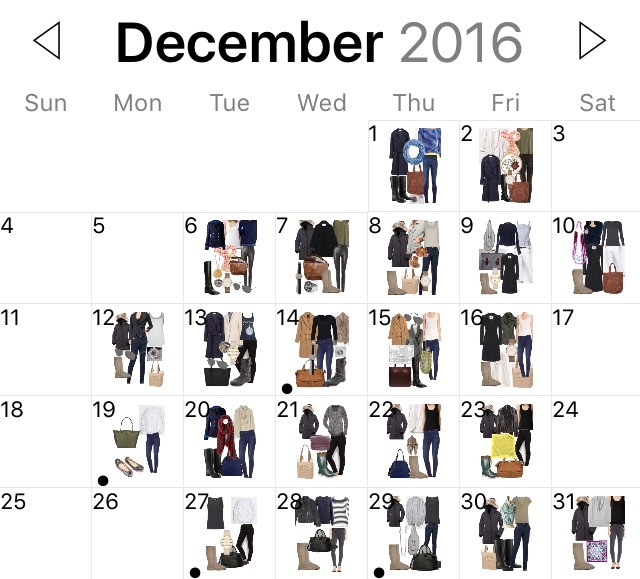 A Month’s worth of Style: December 2016 | Save. Spend. Splurge. I use the StyleBook app and you can read my review of the app here and here are all of my Month of Style posts. December has come and gone, and I realized that I became more of a homebody than I expected, with so many blank spots all over the place, I didn’t really go out much. I stayed in, and instead, did all my shopping online. 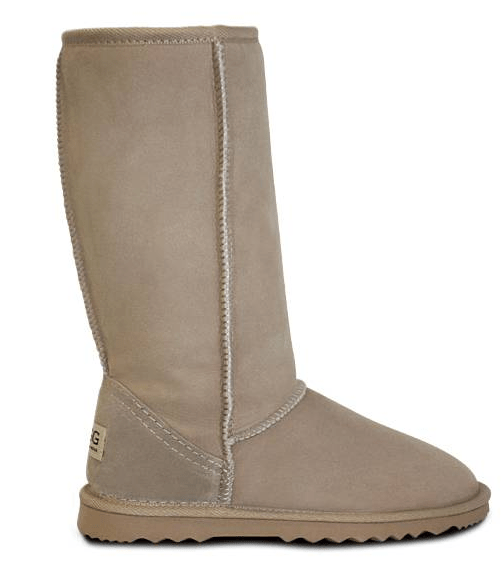 My Australian Made UGG boots have been my favourite pair of boots to wear this winter. I don’t wear them when it’s slushy, only when it’s dry and I plan on walking a lot (or am just lazy). They keep my feet super toasty warm without being sweaty, and they are ugly, but they are comfortable and comfort wins over all. If the sidewalks are drier, I wear my leather boots but that hasn’t happened often. For the stretch of December 27th to December 31st, I dressed JUST FOR SHOPPING. That means, a tank top, shoes, comfortable boots, and a big bag to carry all my things. I usually dress very minimally when I shop, even without any jewellery because I need to be able to try on necklaces and so on. I tend to wear my Canada Goose parka (this is my exact model / brand called the Trillium) when I am out because of all the pockets (4 in front, one inside the jacket). I can go out with just the jacket and Baby Bun’s spare clothing for possible accidents, and be completely purse free. I don’t know why, but I am wearing a lot of black, gray and dark colours this winter. What is happening to me? Is my rainbow-coated style soul being smothered by ashes of a French minimalist wardrobe? I don’t know, but my outfits are darrrrrrrrk. The only colour I add now is just a striped shirt here and there or some colourful scarves or jewellery. Instead of buying pieces I can make myself, why not just make them? I may be trolling Etsy a lot more often to buy beads to dream up of necklaces and things. I only just have been ripping apart my old necklaces and re-threading them, making something new out of something old, but I have been sourcing and pricing the cost of the beads at retail and I am shocked at the cost. $12 for 6 little round beads? I would need 24 of them to make a really magnificent three tiered necklace! Anyway, it doesn’t look like I’ll be starting a jewellery shop soon, but you never know. I just might. Out of curiousity, which ones do you like, below? Note that all the necklaces that look long are separate ones, and are meant to layer against each other. I vow for next month, to wear more colour, or at least try. I haven’t worn any skirts with tights yet… I should. P.S. I use the StyleBook app and you can read my review of the app here and here are all of my Month of Style posts. Personally, I like the long turquoise necklace that looks a little bit like a station necklace, and the yellow one that you added the little gold beads to. Normally I wouldn’t go for anything as chunky as the yellow one, but the gold beads add something special to it. I have ripped apart that yellow chunky one three times before I was satisfied. I am planning on re-doing it so that it lays flat with a little wire or some work, but I like the addition of the gold beads too, it breaks up the monotony. Ups–forgot to add that the pieces you have made thus far are all very pretty. I particularly like the combination of the turquoise beads with the touch of orchid pink beads. Thank you! It is very nice of you to say so. I like that particular necklace, myself. I wasn’t sure what to do with the beads as they are quite large and need to be spaced out properly, but the mix of turquoise & pink has helped. I love to make jewelry for fun, and to give as gifts to friends, but as you, was finding this to be an expensive hobby, particularly because I like to use semi-precious stones (not just colored beads made in China), and sterling silver or 14k gold plated findings. Then, I discovered that I could find old jewelry at thrift stores for very little money, often with the components I like to use. It does take some looking (don’t like plastic beads, although crystal beads can also be very pretty), but to give you an example, I found last month an old necklace with beautiful amethyst beads in different shapes (at least 50 of them) for just $3. While every bit helps, I agree with you that though a great outlet for one’s creativity, jewelry making often is not a cheap hobby. I have been hunting in thrift stores through all the bead bins and I haven’t found any real stones yet, it really does take time and I think the most beautiful pieces are passed down to friends or others. What I’ve noticed, is that I prefer to rip apart my old necklaces and create new ones. It’s becoming a real hobby to pass the time but it won’t be a career.